The CE-TECH 50 ft. White 6C Station Wire accommodates use in both indoor and outdoor installations. This CMX station wire is not designed for use as a substitute for flat-style line cords. CE Techs RCA to 100 Punch down Inserts are designed for standard RCA audio connections and 24AWG UTP Category wiring . Snap these keystone inserts into any keystone housing, wall plate, or dicor insert to terminate your audio connections that are run using Cat 5e UTP wiring. 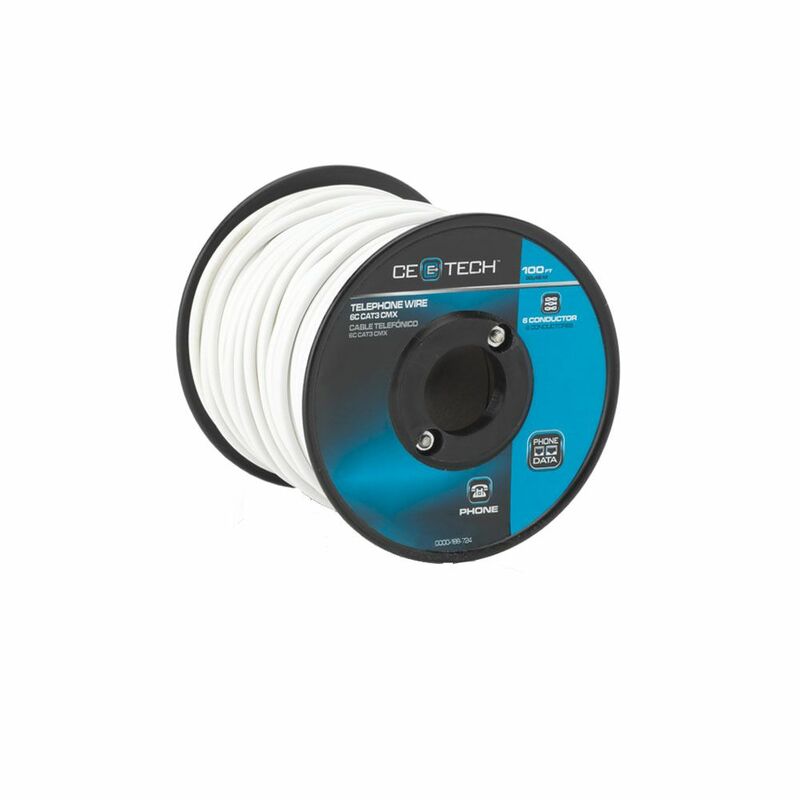 100ft 4C Station Wire The CE-TECH 50 ft. White 6C Station Wire accommodates use in both indoor and outdoor installations. This CMX station wire is not designed for use as a substitute for flat-style line cords. 100ft 4C Station Wire is rated 4.2 out of 5 by 9. Rated 5 out of 5 by dfswan from It was nice to have the old Red, Green, Black, Yellow, Blue and White standard, matching most of ... It was nice to have the old Red, Green, Black, Yellow, Blue and White standard, matching most of the old Phone jacks. The new standard is Blue with white, White with Blue, Orange with white, White with orange, and Green with white, and white with green. It was also solid enough to make connecting to screw terminals easy. Conceivably the new UTP Twisted Pair has slightly less noise, but I don't think it is noticeable on less than 200 feet. Rated 1 out of 5 by Kyle from The wire size is too small to work with a standard bell phone connector. Had to wrap the wire aro... The wire size is too small to work with a standard bell phone connector. Had to wrap the wire around screws to make contact. The wire breaks very easy. Would not have bought this item if proper size 2 line wire was available in store. Rated 5 out of 5 by 130 from Phone wire The wire was a better gauge and has good insulation around each individual wire. Easy to work with. Rated 4 out of 5 by Sue from Good quality wire The wire was made of good quality and was easy to work with. I used it to move my internet modem and rewired several old phone wires. Also will install a doorbell. Rated 5 out of 5 by geo615 from Just what I needed Basic telephone wire at a decent price. I just needed to move one phone about fifty feet. I only needed one twisted pair and this wire contains four. Great in case I nee to run another phone from the same wire. Rated 3 out of 5 by ChrisMaple from Not as advertised Wire is solid copper-coated steel, not stranded as claimed. Solid wire is better for outdoor phone use anyway. Good data wire would be solid, all copper, twisted pairs. This product is just 6 insulated wires laid parallel inside an outer insulator. Long runs will suffer crosstalk. Inner insulation is quite rugged, outer insulation seems good also. Rated 5 out of 5 by LesterT from Was easy to use I purchased this phone cable to extend a phone outlet inside the wall and down again about 40 feet away. Worked just fine and was easy to use. Rated 5 out of 5 by RonG from Did what I Needed. I only needed 50 ft but this was in stock and cheaper than buying by the foot. The product is good and worked fine for my connection.